Because my husband works there, I sometimes have cause to be at the Lyons shops. As far as shops go, they’re not great. The supermarket is pretty ordinary and there is no coffee shop. Indeed, I wish my husband had been more considerate and placed himself at, say, the Chifley shops or the Garran shops – both of which have much better facilities and a much nicer feel. However, the little ol’ Lyons shops have recently had a million dollar makeover, courtesy of the ACT government, and do now look a little more respectable. The upgrade has centred mainly on landscaping; paths and car park facilities have been improved. Best of all, a terrific piece of art has been installed: “On the Road Again” (above). But the talk around town is that of all the things needed to bolster these low key, low turnover shops, art is not at the top of the list. Would it perhaps have been better, people are saying, if the government had spent that money (around $150K for the sculpture, I believe) on facilities that would make the shops more family friendly? How about a playground or BBQ facilities? But regardless of its location, I do so love Canberra’s public art. As you would expect, it is mostly concentrated in the city, where the crowds are, but can also be found at many suburban shopping centres, such as Hughes, Ainslie and the aforementioned and wonderful Chifley. 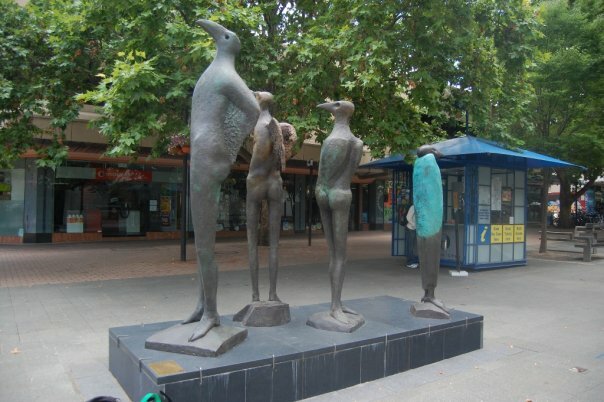 One of my favourite pieces is “Icarus” by Jan Brown, in the city (Petrie Plaza). This work comprises four cast bronze figures which are inspired by the ancient Greek myth of Icarus. In this story, Icarus’ father creates wings from bird feathers and wax for himself and his son to flee from captivity on the island of Crete. Icarus is warned by his father not too fly too close to the sun or the sea. However, overwhelmed by the joyous experience of flight, Icarus flies too high, his waxen wings melt and he falls to his death. The lofty statues are between 1.8 and 2.6 metres high and their presence in Petrie plaza is intense, if not a little sinister. The cold, hardness of the bronze, coupled with the humanness of the forms is rather confronting. For although quite bird-like in appearance, the mannerisms and demeanour of the four figures impart an undeniably human quality. Each of the four Icarus statues shows varying degrees of humanness. Each has a set of wings too; one set melting, another gone altogether and yet another–a bright aqua set (perhaps representing the sea over which Icarus flew) wrapped protectively around its body. The bird–men appear quite fragile and exposed. Perhaps not all passersby would analyse this or any other piece of public art to such a degree, but I like that the opportunity is there for such contemplation. One piece I’m not so enamoured of is the Indigenous land art display on the GDE (or is it now simply the “GD”? ), near Calvary Hospital, which consists of coloured towers and huge stones. 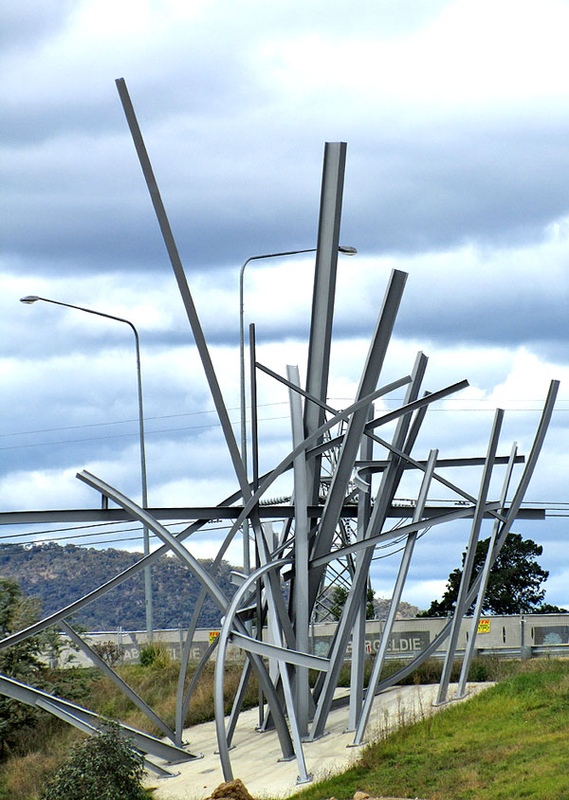 I am also yet to warm to “Rhizome,” the huge metal sculpture at the Barton Highway turnoff of the GDE (below). Each to their own taste, I suppose. There’s another new installation at Cooleman Court, Weston Creek. 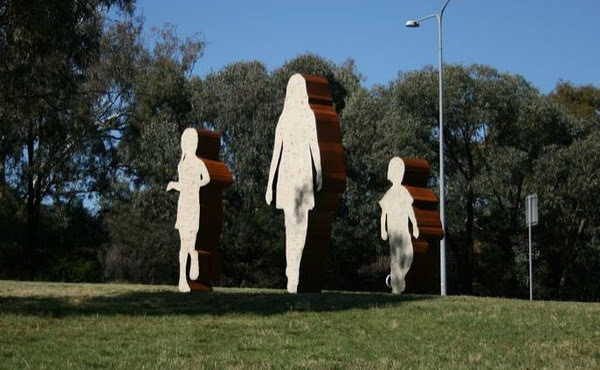 It’s called “A Short Walk” and consists of three siblings made from steel and concrete, to which broken tail light reflectors have been added — signifying the artist’s longstanding concern with car culture and road safety issues. [ii] As with the piece at the Lyons shops, there is conjecture over whether this installation is appropriately placed. Some view it as a distraction for drivers passing through this renowned accident zone. 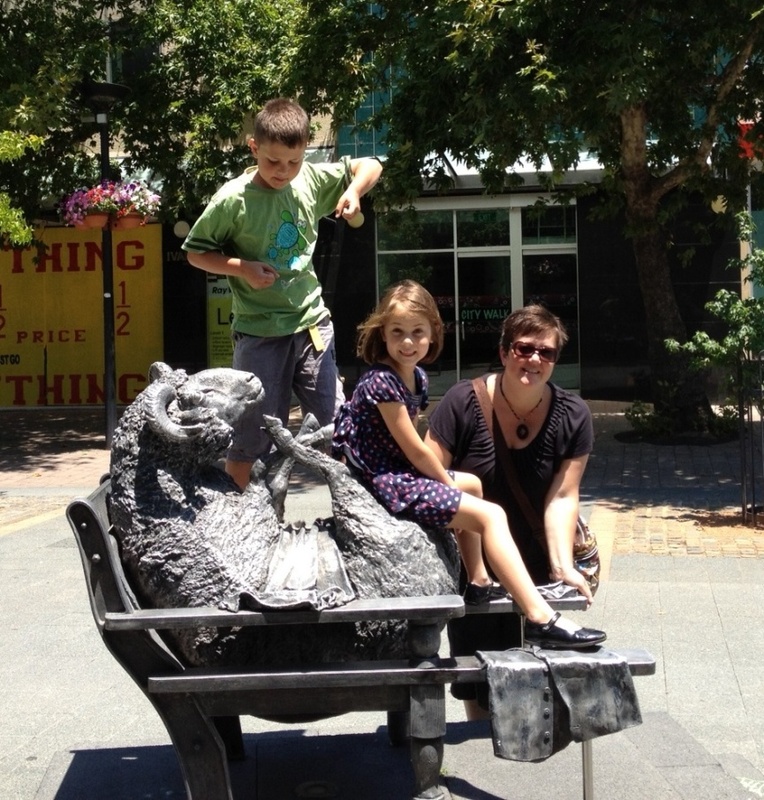 The art work that I would have to say is the most popular with Canberrans — kids who like to climb on it and adults who like to smirk at its cheeky attitude — is Les Kossatz’s “Ainslie’s sheep”. No other sculpture in the Capital demands as much attention as this one and few could dispute the element of joy that it brings to City Walk. ArtsACT director David Whitney says that “’there’s a lot of public art in Canberra because it’s a city of ideas and a city of creation and creativity”[iii] I concur. I think that most people in Canberra appreciate the art works and wouldn’t have it any other way. 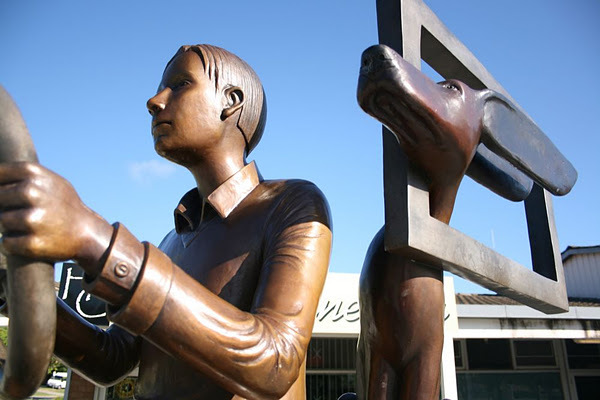 What do you think of the public art in Canberra? Do you have a favourite, or one you love to hate?